Mark McCall’s side ran out 28-20 winners over Exeter Chiefs. 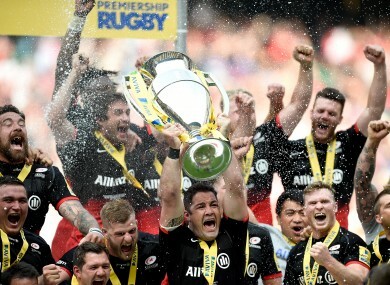 Saracens' Brad Barritt lifts the Aviva Premiership. EUROPEAN CHAMPIONS SARACENS held off a thrilling rally from Exeter Chiefs to retain their Premiership title with a 28-20 victory and complete the first double by an English club since 2004. A fortnight on from their victory over Racing 92 in the Champions Cup final, Mark McCall’s men looked set to record an emphatic win at Twickenham when tries from Duncan Taylor and Chris Wyles put them 20 points clear prior to half-time. However, Exeter refused to give up in their first Premiership final and got back within three points courtesy of second-half scores from Jack Yeandle and Jack Nowell, setting up a grandstand finale. Somewhat fittingly, it was Alex Goode – the competition’s Player of the Year – who settled Saracens’ nerves, scoring the game’s fifth and final try with just four minutes remaining. Saracens therefore emulate Wasps’ achievement of 12 years ago by adding the English domestic crown to their European title, having finished the season with 10 straight wins in all competitions. Owen Farrell landed three penalties to Gareth Steenson’s one prior to being involved in each of his side’s first-half tries as Sarries seized control. A wonderful break through centre field from Schalk Brits gave Saracens a promising platform deep in Exeter territory and, with advantage being played, Farrell delivered a perfectly weighted grubber kick to the left corner, where Taylor was all alone to complete the simplest of finishes. Things got worse for Exeter three minutes later as Wyles collected a floated pass from Farrell, which appeared to go forward, and shrugged off a weak tackle from Henry Slade to go over on the same flank. A second Steenson penalty reduced the Chiefs’ arrears and Rob Baxter’s side also started the second half brightly, gaining reward when Yeandle’s try justified their decision to kick for touch rather than taking another three points. With their physicality suddenly posing problems, Exeter again turned down a shot at goal five minutes later, but failed to add to their score on this occasion as Slade knocked on. However, Slade was then heavily involved as Nowell went over in the right corner, leaving Saracens – who handed a farewell appearance to retiring fly-half Charlie Hodgson in the closing stages – extremely grateful for Goode’s late score. Email “Saracens retain the Premiership title to do a domestic and European double ”. Feedback on “Saracens retain the Premiership title to do a domestic and European double ”.